BARCELONA, Spain ― Samsung Electronics, largely buoyed by a positive response to the dual-edge display of its new Galaxy S6 Edge smartphone, is considering adopting the unique styling to its other high-end models. The Korean tech giant unveiled the Galaxy S6 and its Edge variant on the eve of the Mobile World Congress, the telecom industry’s largest gathering of the year that runs through Thursday in the Catalan capital. The Edge, whose curved display wraps around the sides of the device, is especially being lauded during the exhibition for its premium look and feel ― features that are usually associated with Apple’s iPhones. When the Galaxy Note Edge was first released in September, skepticism shrouded the functionality of the curved display on the right side only, leading to lukewarm sales. Many industry watchers had shown doubts before the unveiling of the new dual-edge display. But the early reaction to the new Edge is explosive, even compared with the response to the flagship S6 with a flat display. Depending on consumer feedback for the technology, the company will decide when to deploy technologies it currently has in store, according to a Samsung official. Samsung’s mobile chief Shin Jong-kyun also hinted at the company’s renewed commitment to the Edge model. “We will make a strong push for the S6 Edge. 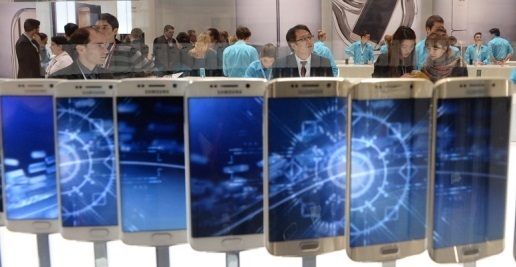 It will outpace its predecessor (the Galaxy Note 4 Edge) in terms of sales,” he said. Analysts pointed out that Samsung will take advantage of the curved display to boost its sluggish device sales in the coming months. “Samsung has lost its ground in the high-end segment to Apple since the Galaxy S5 launch. The company may use the flexible OLED display as a means to restore its reputation as a powerhouse of both design and hardware,” said Jerry Kang, an IHS analyst. He cited high pricing and practicality as key factors for the Edge model to be more widely embraced by customers. Samsung has yet to reveal the official pricing of the model. Kang estimated the price to be 10 percent higher than the iPhone 6.